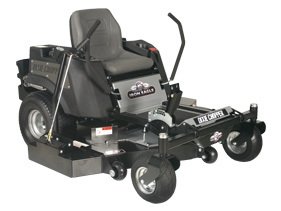 My Dixie Chopper lawnmower which is an Iron eagle model is by far the best lawn mower ever made! It cuts a full 4 acres in less then an hour and most importantly does it flawlessly. It corners, and maneuvers through rough and tight areas like magic, and can literally turn on a dime. Its great for farms, or if you have a lot of land to mow, it is also good it for those that want to start their own landscaping company. If I had 1 more of these then I could go out and find contracts and probably make more money then I do in my office job. My Dixie Chopper makes mowing fun and it does not feel like its work at all. They are pricey but like anything its worth the money, I highly recommend that you go out and get one of these, forget John Deere or the other brands, this is the only thing you will ever need! This mower has problems, broken main belt in a hours of operation, poor cutting, throttle broke. This mower cannot handle a 3 acre job. I had exactly the same problems losing belts, and finally like you figured out the idler was cutting it. As you said, terrible design. I was able to move the wheel, and bought a belt a little narrower and seemed to have solved the problem. I also had exactly the same problem when I tried to change the oil; the fitting was like it was welded on. I had to cut the hose and put a new fitting on. I called about that, and they acted like I did not know what I was talking about, but, hello internet, I was not the only one with this problem. The electricals also quit, and the dealer picked and fixed in about 2 wks., and was told that was not the first one. Stay away from the Iron Eagle; it is an Iron Turkey. I think someone engineered and built it in their back yard. I also have run through several belts, and finally figured out that the idler wheel was mis-aligned and it appears its edge was running against the belt. This seems to be a bad design in that the idler wheel runs too close to the opposite drive wheel. I tried to even the idler so it would not contact the belt, and we will see what happens. I have the Iron Eagle, and while it seems heavy duty, it has had some problems in addition to the belt. It stopped working and dealer picked it up, and found an electrical problem, one they said they had had before with this brand mower. I was going to drain the oil for end of season oil change, and the fitting was practically welded on, so tight I stripped the flats on the fitting. I had to cut the hose and replace the entire fitting.Some really stupid design and manufacturing problems one should not have with a mower which costs over 4k. Would not buy another one. My Dixie chopper has gone through numerous belts. Dixie would not fix could not find any thing wrong. I bought spacers and used a straight edge aligned the belts myself. finally 50 hours without changing a belt.